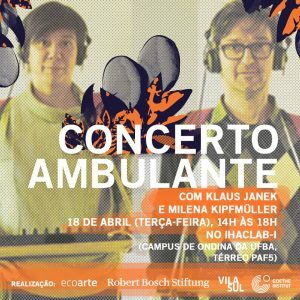 Concerto Ambulante is a city-immersed performance with sound in dialogue with the actual happening environment. We start with no presets and samples and walk through the city together with the audience to discover which sounds and scenes will hit our open mics. All the sounds that will be happening will be found by us on the way and transformed into music instantly. The theatrical part is a descriptional frame that creates scenes by observing them and creating a context, mixing it in dialogue with the musical composition. We broadcast the performance directly to the audiances smartphones that see the synthesis of live-elements interaction – including themselves. This way the city becomes a scenery, the passers by the performers, the observation with transformed soundtrack a video without a screen but with real images. The different layers of everyday moments in the streets, music creation, description, interpretation and imagination flow between each other to open and inhabit the cities stories and fictions. The format works with different layers of reality in terms of real lived experienced now towards the artistically created now. The first reality consists out of sounds appearing in syncronisation to their visual appearance (a stick hits metal – you hear / you see). Headphones are transparent by letting the real sound through and mixing it to the produced sound. The next layer is the appearance of the sound without visual appearance. The idea of artistic manipulation is raising. The transparently collected sounds become a “new” musical function and with this loose their original significance and meaning. The artistically created music out of the collected sounds creates a friction by coexisting to the natural with still are reaching the ear through the headphones. The same process happens to the words creation of Milena Kipfmüller. The description of the real now blurries into a fiction which is seen or starts from the seen and transformes into an artistic word production.